Photos courtesy of Kickapoo Coffee. Flavors of plum and dark cherry with citrusy acidity and a rich, almond sweetness. This lot from our partners at Cenfrocafe marks a new phase in one of our oldest relationships. 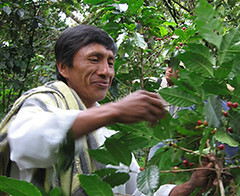 Cenfrocafe was founded in 1999 with 220 small-scale coffee farmers in 11 community-based organizations. Today it serves 2,000 farmers in 52 organizations. As the cooperative has grown, our direct contact with individual growers has diminished. This lot is the result of a new initiative that seeks to change that. Working with Cenfrocafe, we’ve arranged a direct relationship with the farmers surrounding a single village, Huabal–an arrangement that provides us with more consistent coffees and an avenue to work directly with the same growers year in and year out. On the whole, the village produces around three containers of coffee a year; we’re buying a third of that. Like all of Cenfrocafe’s coffees, this lot’s been sorted and separated meticulously. Huabal boasts some of the highest altitudes within Cenfrocafe with some areas situated above 1,900 meters. We’re pleased as punch with this release from the Huabal growers: plumy and rounded with notes of dark cherry and citrus. Maintaining truly direct and meaningful relationships with farmers is extremely difficult for coffee roasters, as importing and communicating with farmers takes resources most small companies do not have. To overcome this obstacle, Kickapoo Coffee is an owner-member of Cooperative Coffees, a fair trade importing business owned by 23 like-minded roasters who are actively engaged in supporting our own importing cooperative. We import over 85 percent of our coffees through Cooperative Coffees, and this number is increasing each year as we develop partnerships with new producers around the world. Through Cooperative Coffees we set the bar higher for the fair trade world. Our pricing minimum is set at a price that is substantially above fair trade standards. We also offer our farmer-partners much-needed pre-harvest financing. Fair trade at Kickapoo Coffee goes beyond pricing to building relationships and partnerships with our growers. Because we import our own coffees, we are communicating with growers directly, not through a middleman. Maintaining direct relationships with producers is very different from buying and selling fair trade coffee from an importer. We get to participate in the lives of our farmers directly, seeing where the roadblocks are, and devising solutions for a more sustainable partnership. Every year we invite and often sponsor farmer coop representatives to our annual meetings and give them a voice in our business decisions. Cooperative Coffees also sponsors an annual meeting with representatives from a dozen Latin American farmer groups. These meetings allow roasters and farmers to learn from each other and look for ways to improve trading relationships. What’s more, farmers from different countries are able to share their experiences and learn from each other. This kind of involvement is very difficult to achieve as a small, independent coffee roaster. Visiting our growers is a very important part of what we do. Our cooperative makes annual visits to each of our producer groups. These trips are focused on mutual benefit. We want to make sure farmers are treated fairly and that we in turn are getting the best quality possible. Our goal on these trips is to better understand the conditions that our farmers are working under and to find where we can encourage further quality initiatives.